The original companion planting of the Native Americans. 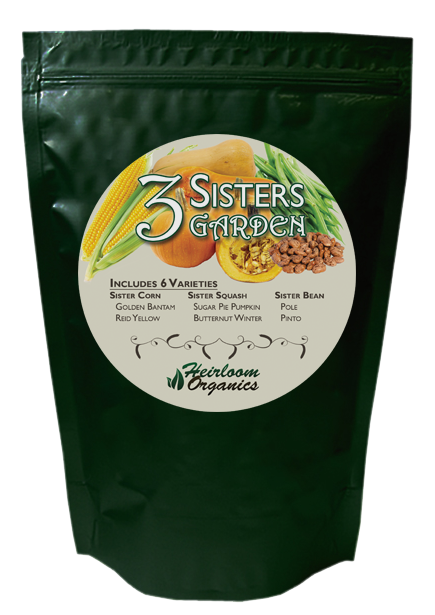 Corn, beans and squash planted together are called the three sisters. These three crops were some of the first domesticated by the early natives. Iroquois legend says that these three inseparable sisters were a gift from the Great Spirit. The Iroquois had been growing the "Three Sisters Garden" for over three centuries before the European settlers came to America. These vegetables sustained the Native Americans both physically and spiritually. In legend the plants were a gift from the gods always to be grown together and eaten together. Each of the sisters contributes something to the planting. Together the sisters provide a balanced diet from a single planting. The term “Three Sisters” emerged from the Iroquois creation myth. It was said that the earth began when “Sky Woman” who lived in the upper world peered through a hole in the sky and fell through to an endless sea. The animals saw her coming, so they took the soil from the bottom of the sea and spread it onto the back of a giant turtle to provide a safe place for her to land. This “Turtle Island” is now what we call North America. Sky woman had become pregnant before she fell. When she landed, she gave birth to a daughter. When the daughter grew into a young woman, she also became pregnant (by the West wind). She died while giving birth to twin boys. Sky Woman buried her daughter in the “new earth.” From her grave grew three sacred plants—corn, beans, and squash. These plants provided food for her sons, and later, for all of humanity. These special gifts ensured the survival of the Iroquois people. Sister Corn, the older sister, offers the beans needed support. She provides a natural pole for bean vines to climb. Sister Bean, the giving sister, fix nitrogen into the soil for the benefit of all three plants. As she climbs the corn she also helps stabilize the stalks to prevent them from blowing over in the wind. Sister Squash, the protective sister, with her large leaves acting like a living mulch to protect the soil and help retain moisture. Spiny varieties also help deter predators from the Corn and Beans. Traditionally drying varieties were chosen to sustain the native people through the winter. Together the three sisters provide sustainable soil fertility and a healthy diet!